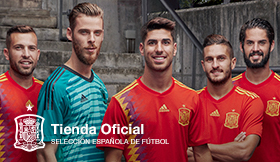 These provisions regulate the use of the services on the Website https://www.sefutbol.com/ (hereinafter the "Website") that R.F.E.F. (hereinafter “R.F.E.F“) puts at the disposal of internet users. R.F.E.F, domiciled at Calle Ramón y Cajal s/n 28230 Las Rozas (Madrid), is registered in the Registry of Sports Entities of the Community of Madrid, under number 19. Access and use of the Website attribute the condition of user of the Website (hereinafter, the “User”) and implicates the acceptance of all the conditions included in this Legal Notice, as well as any modifications herein. Post: Calle Ramón y Cajal s/n, 28230 Las Rozas (Madrid), España. It is strictly forbidden to partially or fully use the photographic content without express authorization by the RFEF.